It’s often the case that many contemporary electronic outfits seem to be content to rehash the sounds of the 80s. They hold the classic synthpop period in such reverence that the idea of music going beyond that benchmark seems inconceivable. Not to rain down on the obvious audience out there for such music, but at times it seems as if it’s probably overdue perhaps for its own genre. It’s become such a default setting that when bands rock up wearing their influences on their sleeve, yet somehow building beyond the restrictions of their inspirations, it’s not only a surprise but also a refreshing change of pace. Wakefield synthpop outfit Berlyn Trilogy do interesting things with these tropes of classic synth and, as a result, have managed to stand out as one of the finest synthpop outfits of the modern era. The release of their 2014 album A Perfect Stranger, for example, presented a collection of solid synthpop that boasted the percussive pop of ‘Synthetic Love’ and the epic tones of ‘The Drone’. They’re also more than capable of holding their own in a live setting. The Wakefield trio have previously commanded the stage at events including Silicon Dreams and Synthetic City. Their easy going chemistry on stage lending the band a charm that never undermines their ability to belt out a good tune. Although the outfit has seen some changes from their initial lineup (original member Dorian Cramm has since gone on to form the equally excellent Promenade Cinema), the current team of James Beswick, Simon Rowe and Faye Williams have wasted little time in demonstrating that they’re a synthpop outfit with some chops. Their new EP Flowers Fall is no exception, offering darkpop delights that also have a gothic sensibility weaved into the mix. Here, rich textured backdrops present the perfect stage for potent slices of synth-fuelled perfection. 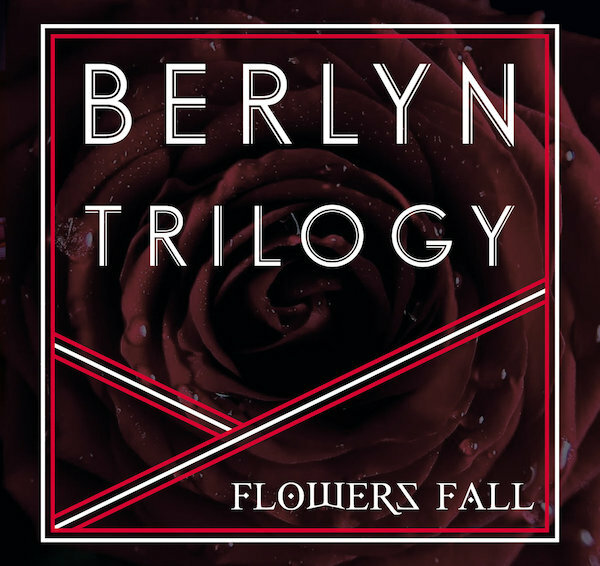 There’s nods to the influence of the likes of The Human League, Ultravox and Depeche Mode seeded throughout, but Berlyn Trilogy are an outfit whose voice is wholly unique. The lyrical content for many Berlyn Trilogy tunes also tend to veer to weighty and unusual influences. The tracks on Flowers Fall being no exception. It’s not often that synthpop outfits pen songs inspired by vast palaces from the period of Ancient Rome, but ‘Domus Aurea’ does just that. Meanwhile, ‘Simone (Nicole)’ takes inspiration from the story of French resistance fighter Simone Segouin. The idea of weaving in such solemn themes into synthpop tunes could, in the hands of lesser talents, be a ponderous affair that borders on the pretentious. But Berlyn Trilogy have a confidence in the delivery of their music that lends these compositions with exactly the weight they require. Certainly, the muscular power of opening track ‘Domus Aurea’ gives the EP an immediate impact. This muscular electropop workout boast burbling synth beds that provide a solid foundation for the in-your-face percussive synth tones. Meanwhile, the vocals have a power all their own (“I build my empire on poison and desire (compulsion, corruption; your strategy)/Don’t question my morality, my deftly woven strategy”). Evocative sirens open up ‘Simone (Nicole)’ for a number that combines sweeping synths with confident electronic melodies. Its lyrical themes, inspired by the aforementioned World War II heroine, have a profundity that lends this outing its own particular nobility (“You’re the heroine of liberty/Effortless style and dignity”). Conversely, ‘Rain’ offers a more sedate outing in comparison – its driving percussive bass nevertheless giving the track its own impressive power. Meanwhile, the EP also offers up a generous number of remixes, including contributions by Nature of Wires, Destination, Fourth Engine, Real Experts and Parralox. The Jarre-eseque electropop that Destination lend to ‘Simone (Nicole)’ stands out in particular. But Fourth Engine’s emphasis on the burbling synths that drive ‘Domus Aurea’ and Nature of Wire’s machine-like workout for the same track are also solid remixes. Flowers Fall is out now.